CMS is taking aim at increasing the use of generic drugs in ACA plans in a new rule filed Thursday evening. 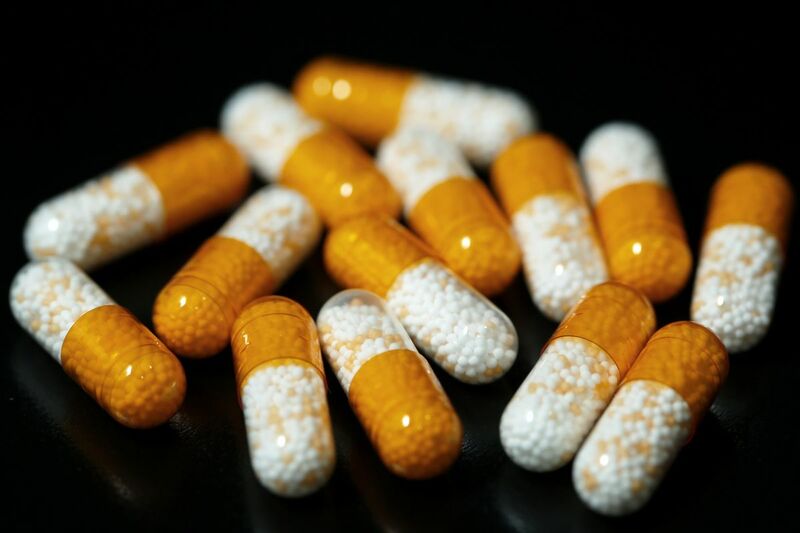 In the rule (PDF), the Centers for Medicare & Medicaid Services included a provision to allow insurers in the 2020 plan year to implement copay accumulator programs that would block the use of manufacturer coupons to lower annual out-of-pocket costs on certain brand name drugs when there’s a generic available. Virginia and West Virginia have banned these programs in their individual markets, and several additional states are considering similar moves. CMS, however, argues that the practce would decrease drug spending and encourage people to use generics. “At CMS, we have improved the operations of the exchange to deliver a better consumer experience at a lower cost,” CMS Administrator Seema Verma said in an announcement. CMS reiterated its support for a legislative fix to end ACA plan “silver-loading,” including the potential for cost-sharing reduction payments to be reinstated. It noted that all the comments it received in response to a request for more information in the proposed rule supported allowing silver loading to continue. Insurers offering plans on the Affordable Care Act exchanges responded to the Trump administration’s 2017 decision to end CSRs by stacking most premium increases on silver plans, which are used to determine federal subsidies. This offered an alternative way to lower cost-sharing. It did not take any action to change the practice. The earliest it might act would be for the 2021 plan year, CMS said. CMS is also considering changes for automatic re-enrollment in 2021, according to the rule. The agency requested feedback on changes in this area as well in the proposed rule. CMS expressed concern that the current form of re-enrollment may prevent plan members from updating their information in a timely manner, which could lead to wasteful spending on tax credits. All commenters that weighed-in on the issue called for CMS to leave the current re-enrollment policy in place, as it eases administrative burden and can prevent lapses in coverage. The rule also finalizes several policy adjustments for the 2020 plan year in the individual, small group and large group markets. The agency reduced user fees borne by insurers that funds operation of state exchanges and Healthcare.gov from 3% to 2.5%. This decrease will go toward further decreasing premiums, CMS said. CMS also aimed to improve transparency in its enhanced direct enrollment program, which allows people to sign up for ACA plans directly through an approved payer or broker without the need to visit Healthcare.gov. Web brokers will be required to provide the agency will a list of brokers and agents that use their platforms. Large drug makers and the industry’s primary trade group neared previous spending records on lobbying in the first three months of the year as President Donald Trump and Congress increased pressure to rein in the cost of medicine. The Pharmaceutical Research and Manufacturers of America trade group, which represents 37 drug companies, spent $9.91 million in the first quarter, up from $6.03 million during the last quarter of 2018, and just shy of its record a year earlier, according to disclosures filed with Congress before a Monday deadline. Drug companies are facing an unprecedented threat to their pricing practices as the president and lawmakers from both parties have targeted the high costs of drugs. That has become one of the few areas of bipartisan agreement in an otherwise divisive political climate. The Trump administration has proposed new rules and approved a slew of new generic drugs, sending a signal that more ambitious changes may be needed to lower pharmaceutical prices for Americans. That’s spurred drugmakers to reveal prices of their prescription drugs on websites for the first time in a bid to avoid being forced to make even more public disclosures in TV ads. Two of the world’s biggest insulin producers started offering bigger discounts — prompting Congress to call for more action and criticize the companies for waiting for so long. AbbVie Inc., AstraZeneca Plc, Bayer AG, Biogen Inc., Bristol-Myers Squibb Co., Merck & Co. Inc., Novartis AG, Pfizer Inc. and Sanofi all bolstered their first-quarter spending compared with the fourth quarter, according to the filings. Novartis hiked its spending an eye-popping 450 percent to $3.2 million from $580,000, and that figure was also about 5 percent above what it spent a year earlier, the filings show. Merck spent $2.74 million in the period, more than 200 percent more than in the last quarter of 2018, but that figure was down more than 17 percent compared with the year before, when it was one of several companies to set a group record. AstraZeneca, Biogen and Bristol-Myers all spent more than their year-earlier levels. Those companies and AbbVie, Merck, Novartis, Pfizer, Sanofi, Johnson & Johnson all disclosed lobbying on drug pricing, among other issues. The tide has turned for drug companies in Washington after years of being able to keep Congress at bay. A February hearing before the Senate Finance Committee that called on top officials from seven major drugmakers was touted as a moment of reckoning that could lead to a clampdown similar to what Big Tobacco faced in the late 1990s. But there were few fireworks, with lawmakers largely refraining from bashing the companies, which blamed a patchwork of incentives for high out-of-pocket costs for patients. One sign that the drug lobby was losing its grip on Congress came in the first quarter of 2018, when PhRMA was blindsided by a change lawmakers made to Medicare that put drugmakers on the hook for more of seniors’ prescription costs. In that quarter, PhRMA and companies including AbbVie, Bayer, Celgene Corp., Novo Nordisk A/S and Sanofi set quarterly lobbying spending records. America’s Health Insurance Plans, a trade group representing insurers, spent $2.88 million on lobbying, including on Medicare for All, according to its disclosure. That figure was up more than 87 percent from the previous quarter and up 26 percent from a year earlier. The disclosures generally don’t say what positions a trade association or company took on any given issue. 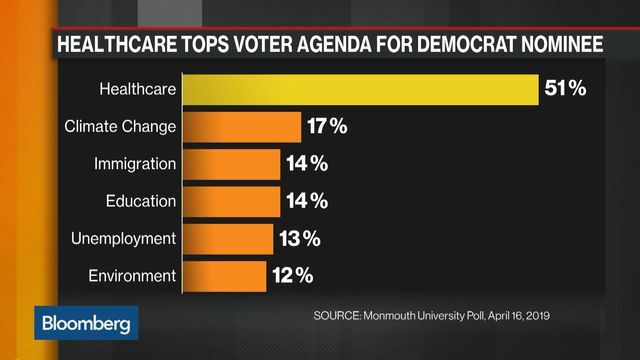 Medicare for All has become a litmus test between progressives and moderates in the race for the 2020 Democratic presidential nomination. Medicare’s hospital insurance fund will be depleted in 2026, as previously forecast, and Social Security program costs are likely to exceed total income in 2020 for the first time since 1982, according to a government report released on Monday. Senator Bernie Sanders, among a large field of contenders for the Democratic presidential nomination, has unveiled a “Medicare-for-All” plan that would eliminate private insurance and shift all Americans to a public healthcare plan. However, Republicans have denounced the proposal as impractical and too expensive. “At a time when some are calling for a complete government takeover of the American health care system, the Medicare Trustees have delivered a dose of reality in reminding us that the program’s main trust fund for hospital services can only pay full benefits for seven more years,” Seema Verma, administrator for the Centers for Medicare & Medicaid Services (CMS), said. The report said costs associated with the Medicare Supplementary Medical Insurance (SMI) trust fund, which covers drug costs in Part B and D in the program for seniors, are likely to grow steadily from 2.1 percent of gross domestic product in 2018 to about 3.7 percent of GDP in 2038, given the aging U.S. population and rising costs. Cost projections for Part D drug spending, which covers prescription medicines obtained at the pharmacy, are lower than in last year’s report because of slower price growth and a trend of increasing manufacturer rebates, CMS said. Part B primarily involves specialty drugs administered on an in-patient basis. Trustees project that the SMI fund for Part B and Part D will remain adequately financed into the indefinite future because current law provides financing from general revenues and beneficiary premiums each year to meet the next year’s expected costs. The Trump administration in January proposed a rule that would overhaul the use of rebates in government-run healthcare plans, potentially ending a decades-long system under which drugmakers provide large discounts off the list price of their medicines to benefits managers and insurers rather than to consumers. For a patient’s knee replacement, Medicare will pay a hospital $17,000. The same hospital can get more than twice as much, or about $37,000, for the same surgery on a patient with private insurance. Or take another example: One hospital would get about $4,200 from Medicare for removing someone’s gallbladder. The same hospital would get $7,400 from commercial insurers. The yawning gap between payments to hospitals by Medicare and by private health insurers for the same medical services may prove the biggest obstacle for advocates of “Medicare for all,” a government-run system. If Medicare for all abolished private insurance and reduced rates to Medicare levels — at least 40 percent lower, by one estimate — there would most likely be significant changes throughout the health care industry, which makes up 18 percent of the nation’s economy and is one of the nation’s largest employers. Some hospitals, especially struggling rural centers, would close virtually overnight, according to policy experts. Others, they say, would try to offset the steep cuts by laying off hundreds of thousands of workers and abandoning lower-paying services like mental health. The prospect of such violent upheaval for existing institutions has begun to stiffen opposition to Medicare for all proposals and to rattle health care stocks. Some officials caution that hospitals providing care should not be penalized in an overhaul. Dr. Adam Gaffney, the president of Physicians for a National Health Program, warned advocates of a single-payer system like Medicare for all not to seize this opportunity to extract huge savings from hospitals. “The line here can’t be and shouldn’t be soak the hospitals,” he said. Soaring hospital bills and disparities in care, though, have stoked consumer outrage and helped to fuel populist support for proposals that would upend the current system. Many people with insurance cannot afford a knee replacement or care for their diabetes because their insurance has high deductibles. Proponents of overhauling the nation’s health care argue that hospitals are charging too much and could lower their prices without sacrificing the quality of their care. High drug prices, surprise hospital bills and other financial burdens from the overwhelming cost of health care have caught the attention (and drawn the ire) of many in Congress, with a variety of proposals under consideration this year. But those in favor of the most far-reaching changes, including Senator Bernie Sanders, who unveiled his latest Medicare for all plan as part of his presidential campaign, have remained largely silent on the question of how the nation’s 5,300 hospitals would be paid for patient care. If they are paid more than Medicare rates, the final price tag for the program could balloon from the already stratospheric estimate of upward of $30 trillion over a decade. Senator Sanders has not said what he thinks his plan will cost, and some proponents of Medicare for all say these plans would cost less than the current system. Hospitals could lose as much as $151 billion in annual revenues, a 16 percent decline, under Medicare for all, according to Dr. Kevin Schulman, a professor of medicine at Stanford University and one of the authors of a recent article in JAMA looking at the possible effects on hospitals. Richard Anderson, the chief executive of St. Luke’s University Health Network, called the proposals “naïve.” Hospitals depend on insurers’ higher payments to deliver top-quality care because government programs pay so little, he said. “I have no time for all the politicians who use the health care system as a crash-test dummy for their election goals,” Mr. Anderson said. The American Hospital Association, an industry trade group, is starting to lobby against the Medicare for all proposals. Unlike the doctors’ groups, hospitals are not divided. “There is total unanimity,” said Tom Nickels, an executive vice president for the association. Rural hospitals, which have been closing around the country as patient numbers dwindle, would be hit hard, he said, because they lack the financial cushion of larger systems. Big hospital systems haggle constantly with Medicare over what they are paid, and often battle the government over charges of overbilling. On average, the government program pays hospitals about 87 cents for every dollar of their costs, compared with private insurers that pay $1.45. Some hospitals make money on Medicare, but most rely on higher private payments to cover their overall costs. Medicare, which accounts for about 40 percent of hospital costs compared with 33 percent for private insurers, is the biggest source of hospital reimbursements. The majority of hospitals are nonprofit or government-owned. The profit margins on Medicare are “razor thin,” said Laura Kaiser, the chief executive of SSM Health, a Catholic health system. In some markets, her hospitals lose money providing care under the program. She says the industry is working to bring costs down. “We’re all uber-responsible and very fixated on managing our costs and not being wasteful,” Ms. Kaiser said. Over the years, as hospitals have merged, many have raised the prices they charge to private insurers. Many hospitals have invested heavily in amenities like single rooms for patients and sophisticated medical equipment to attract privately insured patients. They are also major employers. People who have Medicare, mainly those over 65 years old, can enjoy those private rooms or better care because the hospitals believed it was worth making the investments to attract private patients, said Craig Garthwaite, a health economist at the Kellogg School of Management at Northwestern University. If all hospitals were paid the same Medicare rate, the industry “should really collapse down to a similar set of hospitals,” he said. Whether hospitals would be able to adapt to sharply lower payments is unclear. But proponents should not expect to save as much money as they hope if they cut hospital payments. Some hospitals could replace their missing revenue by charging more for the same care or by ordering more billable tests and procedures, said Dr. Stephen Klasko, the chief executive of Jefferson Health. “You’d be amazed,’ he said. While both the Medicare-for-all bill introduced by Representative Pramila Jayapal, Democrat of Washington, and the Sanders bill call for a government-run insurance program, the Jayapal proposal would replace existing Medicare payments with a whole new system of regional budgets. “We need to change not just who pays the bill but how we pay the bill,” said Dr. Gaffney, who advised Ms. Jayapal on her proposal. Hospitals would be able to achieve substantial savings by scaling back administrative costs, the byproduct of a system that deals with multiple insurance carriers, Dr. Gaffney said. Under the Jayapal bill, hospitals would no longer be paid above their costs, and the money for new equipment and other investments would come from a separate pool of money. But the Sanders bill, which is supported by some Democratic presidential candidates including Senators Kirsten Gillibrand of New York, Cory Booker of New Jersey, Elizabeth Warren of Massachusetts and Kamala Harris of California, does not envision a whole new payment system but an expansion of the existing Medicare program. Payments would largely be based on what Medicare currently pays hospitals. Some Democrats have also proposed more incremental plans. Some would expand Medicare to cover people over the age of 50, while others wouldn’t do away with private health insurers, including those that now offer Medicare plans. Even under Medicare for all, lawmakers could decide to pay hospitals a new government rate that equals what they are being paid now from both private and public insurers, said Dr. David Blumenthal, a former Obama official and the president of the Commonwealth Fund. UnitedHealth Group has been a stock market darling for much of the past decade, dependably churning out earnings increases and rewarding shareholders with staggering returns. Its latest quarterly report, issued on Tuesday, was superb, as expected. Earnings per share jumped 24 percent. Based on the news about the diversified health service company’s fundamental businesses, you might have expected its stock price to rise. Nope. UnitedHealth’s share price dropped 4 percent that day and almost 2 percent the next. And, along with much of the health care sector, it has been on a downward trend for the past few months. What’s wrong with the stock? It has nothing to do with the company’s short-term profit outlook, which is splendid. But like other health care companies, UnitedHealth is confronting a major political problem: the ascendance of “Medicare for All” as a lodestar for the Democratic Party. Medicare for All isn’t a new idea. It may be defined, basically, as universal health insurance under a single government-run, taxpayer-financed plan. It would certainly alter, and probably limit, the role of private health insurance companies like UnitedHealth. Senator Bernie Sanders of Vermont has supported the idea for years. But it wasn’t much of an issue for investors because it never went anywhere in Congress. Now, however, Mr. Sanders is the front-runner among the announced aspirants for the Democratic presidential nomination. What’s more, he appears to have moved the entire political conversation into territory that is exceedingly uncomfortable for health care companies. When he introduced a new version of his Medicare for All legislation in the Senate on April 10, the stock market noticed that his co-sponsors included at least four Senate Democrats who are also running for president: Kirstin Gillibrand of New York, Cory Booker of New Jersey, Elizabeth Warren of Massachusetts and Kamala Harris of California. It’s far too early to divine whether Medicare for All — particularly a version that bans or severely limits private insurance — has even a modest chance of coming into existence after the 2020 election. Even now, amid all the hoopla, the odds may not be propitious. The current Democratic leaders in Congress — Senator Chuck Schumer of New York, the minority leader, and Nancy Pelosi of California, the House speaker — have not supported it. President Trump and Republican leaders in Congress have been demanding a smaller government role in health care, not a larger one. And the giant health care companies, which have enormous wealth and influence, are, for the most part, committed to blocking the idea. But that hasn’t stopped the stock market from acting as though Medicare for All were just around the corner. Comments by David Wichmann, UnitedHealth’s chief executive, during an earnings call on Tuesday, appear to have focused market attention on the issue, which made matters worse. He began his prepared remarks to Wall Street analysts with a direct attack on Medicare for All. After his remarks, the company’s shares plunged, and the decline spread to other companies. Data from Bespoke Investment Group shows that the damage to health care stocks became much more acute on Tuesday and Wednesday. On those days, according to Bespoke, the health care sector, dominated by UnitedHealth, underperformed the S&P 500 by its widest margin since April 2009. Investors’ aversion to health care stocks was far greater than it was for any other market sector, using a common measure: the degree to which its share price has dropped below its 50-day moving average. The difference, or spread, between the market’s aversion to health care stocks, the most-hated sector, and its attraction to financial services, the most-loved, was extraordinarily wide. The polarization was greater than it has been for 99.93 percent of all trading days in the American stock market since the start of 1990, Bespoke found. When such extremes in market sentiment have occurred in the past, the depressed sector has rarely bounced back quickly, Paul Hickey, a Bespoke founder, said in an interview. “When momentum is this extreme, it often takes some time to recover,” he said. A Bloomberg article compared the rout in health care stocks to the “‘Dark Days’ of the Financial Crisis,” when, in addition to the crisis afflicting the overall stock market, the sector grappled with uncertainty over what, eventually, became the Affordable Care Act, a.k.a. Obamacare. But as I’ve written, the Affordable Care Act turned out to be a boon for managed care companies, which profited handsomely despite continuing to gripe about the government’s expanded role. In the 10 years through March, for example, UnitedHealth’s shares returned 1,345 percent, including dividends, dwarfing the 376 percent total return for the S&P 500. UnitedHealth trailed Apple’s total return of 1,593 percent and Amazon’s, 2,649 percent, but it was far better than Google (now a unit of Alphabet) at 596 percent. At some point, stocks that fly that high simply drop in value. For health care stocks, this may just be one of those times. But if profits for major health care companies remain strong, as expected, their share prices could begin to stabilize. And if the presidential cycle starts to shift in their favor, they could resume their path upward. It’s even possible that many health care companies, which already do extensive government business, could find ways of prospering under some version of Medicare for All, especially one that reserves a substantial role for private companies. It has been an awful stretch for health care stocks. But it would be foolish to underestimate the companies’ ability to adapt under duress and to ultimately profit, no matter who is in power. The federal trust fund that finances much of the health-care program for the elderly and disabled is projected to run out in 2026, the same year forecast in the most recent projections published in June, trustees for Medicare said in a report Monday. “At a time when some are calling for a complete government takeover of the American health-care system, the Medicare trustees have delivered a dose of reality,” Seema Verma, administrator of the Centers for Medicare and Medicaid Services, said in an emailed statement. The yearly gauges of Medicare’s fiscal health are wonky, technical analyses, watched mostly by economists, actuaries and policymakers. But the release of the report also gives politicians an opportunity to use it as a rhetorical weapon. Verma wasted no time. Moments after the official report was released, her office released a statement criticizing the idea of Medicare for All — a proposal the report doesn’t even mention. Senator Bernie Sanders of Vermont and several other candidates running for the 2020 Democratic nomination want to expand a version of the program to provide free health care to all Americans. “Stripping around 180 million Americans of private coverage and adding them to Medicare won’t fix the problem” of Medicare’s fiscal outlook, Verma said. The updated projection arrives as Medicare takes a central role in the debate about the future of American health care. Republicans and some executives in the health-insurance industry warn that such a proposal could disrupt the economy and force roughly half the American population from the employer health plans they currently have. The prospect of Medicare for All replacing private insurance, however remote, helped send health stocks tumbling last week. The selloff followed an upbeat earnings report by UnitedHealth Group Inc., the largest and first health-insurance company to report first-quarter results. UnitedHealth Chief Executive Officer Dave Wichmann said Medicare for All would be a “wholesale disruption of American health care” that would destabilize the nation’s health system and incur a severe economic cost. Medicare provides government health insurance to about 60 million Americans who are over 65 or disabled, at a cost of about $700 billion last year. The part of the program that pays for hospitalization, known as Part A, relies on a trust fund replenished by dedicated payroll taxes. As expenditures from that trust fund exceed tax revenue, the amount available for Medicare to pay hospitals gradually decreases. The trust-fund-linked hospital payments account for less than half of Medicare’s total spending. Other parts of the Medicare program that pay for physicians and drugs don’t depend on the trust fund. They’re financed through a combination of general tax revenue and premiums paid by beneficiaries. Gov. Gavin Newsom’s ambitious plan to rein in prescription drug costs through a statewide purchasing system — pooling the power of California’s largest public and private buyers — has a new ally: Los Angeles County. In a tentative deal announced Wednesday, the Newsom administration and Los Angeles County said they would sit at the same bargaining table when negotiating prescription drug prices with manufacturers. Newsom said the partnership will hopefully spur other local governments to join the coalition, adding that governors in Rhode Island, Colorado and Illinois have expressed interest in a similar model or joining California’s collective. Newsom made the announcement in front of the Rancho Los Amigos National Rehabilitation Center in Downey on his 100th day in office. His call for taking on the influential pharmaceutical industry was met with cheers from medical staff and patients at the high-tech rehabilitation center. “I don’t want to overstate this, but I don’t want to understate this. This is a big deal,” Newsom said Wednesday. The Newsom administration, however, has yet to release details on how the bulk buying system would work, leaving even the pharmaceutical companies he painted as opponents unable to comment substantively on the plan. Tackling high prescription drug costs was one of Newsom’s first initiatives, which he announced in an executive order shortly after being sworn in. His plan would consolidate drug purchases in the state to make California the nation’s largest buyer. Doing so, Newsom said, would tilt the bargaining power in California’s favor when negotiating prices with drug companies. With the addition of Los Angeles County — and with it drug purchases made on behalf of inmates and county hospital patients — the coalition grew significantly. Much of the specifics about how the plan would work have yet to be announced. While Newsom said he anticipates a major fight with pharmaceutical companies and lobbyists, so far those groups have been relatively quiet publicly as they wait for details on the plan. Newsom said he would like to shield some aspects of the state’s plans from the industry giants who will attempt to kill it. Priscilla VanderVeer, a spokeswoman for the Pharmaceutical Research and Manufacturers of America, said that without details, the lobbying group is currently neutral on Newsom’s plan. The nonpartisan Legislative Analyst’s Office said it could not yet assess Newsom’s plan to consolidate the state’s purchases on high-cost drugs because there are too few details on how it will be implemented. “The administration has yet to share what specific strategies to expand upon existing bulk purchasing efforts are under consideration other than the broad concept of encouraging participation by private entities in the state’ negotiations,” the analyst’s office wrote this month. In a meeting Wednesday with the Los Angeles Times Editorial Board, Newsom disputed that his plan was short on specifics. However, his executive order from January includes just a broad outline with timelines for status reports that have not been made public. 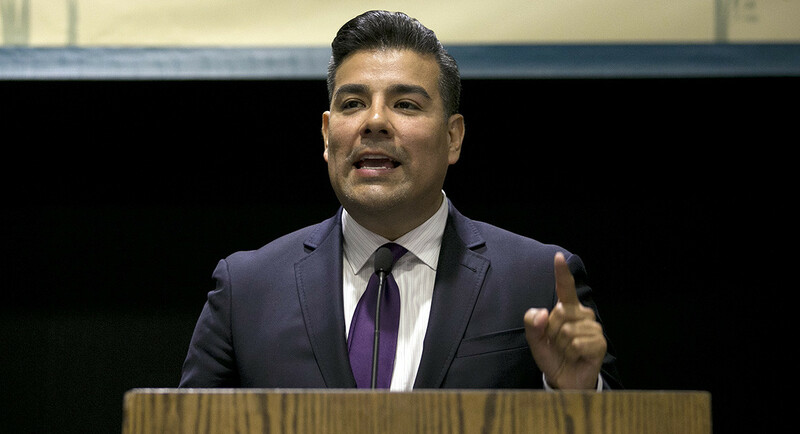 His executive order also called for consolidating prescription drug purchases by January 2021 under the state’s Medi-Cal program, which provides healthcare to lower-income residents. The Legislative Analyst’s Office has estimated that plan could save the state hundreds of millions of dollars, but “it’s highly uncertain” and comes with trade-offs, such as reduced revenue to hospitals and community clinics that receive federal rebates on their drug purchases. The executive order does not set a timeline for Newsom’s plan to create the bargaining collaborative between state agencies, local governments and the private sector. The Department of General Services was tasked with creating a list of high-cost priority drugs the state would like to focus its collective bargaining power on. The agency is in the process of developing a plan for bulk purchases on those medications. Los Angeles County Supervisor Janice Hahn said high prescription drug prices is an issue that Americans want government to deal with and Newsom’s plan to create a coalition to leverage their buying power makes sense. She said the Los Angeles County Department of Health Services alone spends $242 million a year on prescription drug purchases. Cheryle Reidel knows a thing or two about surprise medical bills. There was the $6,000 for a cancer biopsy in 2012. Several years later, an anesthesiologist and a nurse anesthetist billed her $2,600 for another procedure. This year, it happened again: Reidel underwent a colonoscopy at Norwood Hospital — which is fully covered by her insurance plan — only to discover that the anesthesiologist who worked there was not. The bill: $2,490. What happened after Reidel, 64, received these unexpected medical charges illustrates one of the most frustrating and unpredictable aspects of the health care system: It was only after dozens of phone calls and numerous letters to insurance companies and the providers that she got these bills dismissed. Other patients have not been so lucky. Reidel was one of more than 25 readers who wrote to the Globe after the newspaper published a story last month about out-of-network billing, expressing frustration with unexpected charges. Chloe Nasser’s parents have been relentlessly fighting such bills. Last summer, her doctor, who is affiliated with Brigham and Women’s Hospital, ordered routine blood work — at a lab in the same office. She was astonished to get a $701.89 bill a month later because the lab was not in her insurance network. The family is also contesting a much larger out-of-network bill for a colonoscopy Nasser had at the Brigham, said her mother, Kathleen Wynn. Surprise out-of-network medical bills occur when a hospital uses anesthesiologists, radiologists, ambulance companies, emergency medicine doctors, or other providers that are not covered by a patient’s insurance network. Often, providers do not inform patients in advance. The practice is under growing scrutiny nationwide. A new analysis shows these charges, also called balance billing, may be more common in Massachusetts than previously believed. A study by the nonprofit Health Care Cost Institute found that 15 percent of 9,041 in-network hospital admissions in Massachusetts in 2016 included an out-of-network bill from a professional who worked there — the 11th-highest rate in the country. David Seltz, executive director of the Massachusetts Health Policy Commission, a watchdog group, cautioned that the study only examined medical claims from large national insurers. Massachusetts-based insurers tend to have more providers in their networks, so there is less chance for a patient to be hit with a surprise medical bill. Still, the new information “reinforces the need and urgency for the [state] to take action to address this issue and help protect patients,’’ Seltz said. The Globe reported in March that about 115 patients filed complaints about surprise medical bills in 2017 and 2018 with Massachusetts Attorney General Maura Healey’s office. Readers responded to the article quickly and passionately. One theme was clear: Patients usually just paid bills that ran in the hundreds of dollars because they were either too busy or too sick to fight over relatively small amounts; however, others with large balances were relentless in challenging the charges. Many readers held hospitals responsible for using out-of-network doctors. The Globe reviewed bills to verify readers’ complaints. ■ Nancy Welsh took her diabetic daughter to Emerson Hospital’s emergency department last July because she wasn’t eating or drinking. Doctors started intravenous fluids and called Armstrong Ambulance Service to transfer her to Boston Children’s Hospital. Several weeks later, the family received a bill for more than $3,000. Armstrong, it turns out, was not covered by their Aetna insurance plan. After eight phone calls, four e-mails, and a registered letter, Aetna reimbursed Welsh in February. But Welsh wondered why staff at the Concord hospital did not warn her in advance. Emerson spokeswoman Leah Lesser said there are so many different and ever-changing insurance companies and plans that it is often not possible to determine a patient’s coverage in an emergency. “We encourage patients, before they need care, to learn what is covered by their insurance plans,’’ Lesser said in a statement. ■ Jonathan Scott, 61, was diagnosed with advanced cancer in 2016. Scott’s oncologist and surgeon at Beth Israel Deaconess Medical Center were covered by his Tufts Health Plan network, as was the hospital, he said. Another surgeon — apparently not covered — was assigned to implant a tiny catheter above Scott’s heart through which he would get chemotherapy. Weeks later, he received a bill for $1,198. “I couldn’t eat or walk and I was having to deal with the insurance company,’’ Scott said. Tufts eventually agreed to waive the charges, he said. Hospital spokeswoman Jennifer Kritz said she could not comment on Scott’s case because of patient privacy rules but said patients generally need prior approval from their insurance companies for procedures. Patients have been receiving these unexpected bills for years. Doctors often blame insurers for the problem, saying the large national companies don’t pay enough for them to join their networks. Meanwhile, insurers argue that doctors prefer to remain out-of-network because that allows them to charge inflated rates, rather than accept a negotiated fee. A number of states have passed laws regulating out-of-network billing. After failing to pass consumer projections last year, Massachusetts legislators plan to reconsider similar measures this year. Hospital officials often say the problem is between insurers and doctors’ groups. State laws typically include a way for the two sides to reach fair payment rates. But Frederick Isasi, executive director of the nonprofit Families USA, said hospitals share the blame. Reidel, a sales analyst for a medical supply company, agrees. 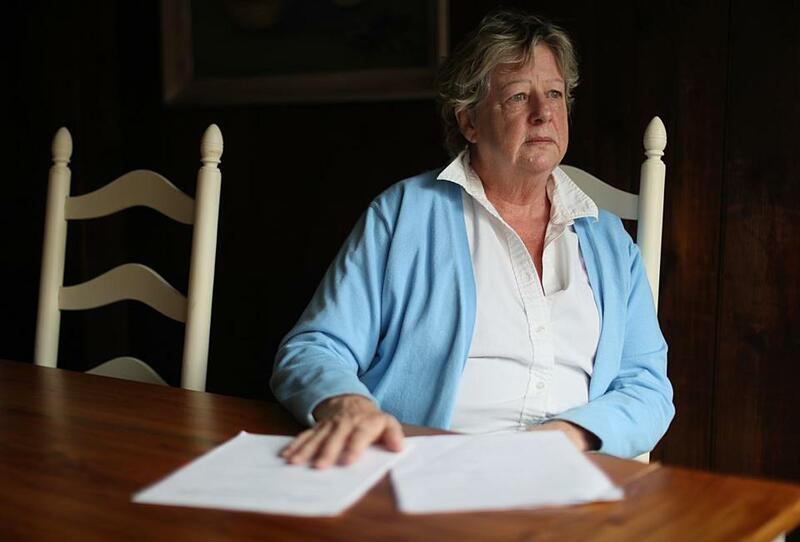 Her first two surprise bills involved care she received at Sturdy Memorial Hospital in Attleboro, which was in her insurance plan’s network, she said. Amy Pfeffer, Sturdy’s chief financial officer, said the hospital strongly encourages all providers to join the same networks as the hospital but does not require it. Mandating it, she said, might force doctors to accept smaller payments from insurers that do not cover their costs. “That would tie their hands,’’ she said. After receiving the $2,490 bill from Ether Anesthesia of Massachusetts following her colonoscopy at Norwood Hospital last year, Reidel left a message for the hospital’s chief executive. Reidel said two weeks later, Norwood’s Chief Financial Officer Elizabeth Ganem told her the charges were resolved. Chloe Nasser’s family is unsure whether they will succeed in their battle over large out-of-network medical bills for medical care at Brigham and Women’s Hospital. Ethan Slavin, a spokesman for Aetna, her insurer at the time, said many Aetna plans include the Brigham in their network. But not Nasser’s particular plan; her Brigham doctor was covered, but the hospital itself was not. And that is where her doctor sent some lab work and where he sent her for a colonoscopy. Wynn, Nasser’s mother, said no one mentioned this possibility. The Brigham said it is improving its educational materials for patients to better explain the medical bills they might face. That information is expected to be ready in May. With the approval of CA AB4 (19R) by the Assembly Health Committee on Tuesday, both houses of the California Legislature have now approved identical measures that seek to expand full-scope Medi-Cal access to all undocumented adults. Now comes the hard part: paying for it. The bills move next to fiscal committees, where they will be formally assigned a price tag. The state Department of Finance concurs with previous analyses that indicate annual state costs of about $3 billion per year to cover adult immigrants age 19 and older. Though the bills have no formal opposition, Gov. Gavin Newsom has cited the steep cost for not proposing to cover all eligible undocumented adults in his first budget proposal. His initial plan would expand access for those between 19 and 26. People up to age 19 are already eligible. Without allowing all income-eligible California residents to enroll in Medi-Cal, the state will not achieve universal health care, said Assemblyman Rob Bonta (D-Alameda), who presented the bill. He argued that the state will see health care costs continue to rise as people with dire medical needs seek care in the emergency room — widely accepted as the most expensive setting. Sen. Bernie Sanders (I-Vt.) on Wednesday unveiled his revamped Medicare for all bill with the support of four Senate Democrats also running for president. Sanders, who is again seeking the Democratic nomination for president in 2020, rolled out the bill that would largely eliminate private insurance and institute a single-payer system managed by the government. “The American people are increasingly clear: They want a health care system which guarantees health care to all Americans as a right,” Sanders said Wednesday. Sens. Elizabeth Warren (D-Mass. ), Kirsten Gillibrand (D-N.Y.), Cory Booker(D-N.J.) and Kamala Harris (D-Calif.) — all 2020 presidential candidates — again signed on to the bill after also supporting it in 2017. Gillibrand was the only one to attend Sanders’ event Wednesday introducing the bill. The updated version will also include coverage for long-term care, such as nursing homes, which is currently not covered by the Medicare program. Home- and community-based care will also be covered. The bill has 14 Senate co-sponsors in all, two fewer than it had in 2017. Former Sen. Al Franken (D-Minn.) had supported the bill two years ago, and Sen. Jeanne Shaheen (D-N.H.) decided not to co-sponsor the bill this year. Shaheen said in a statement she now thinks there are faster ways to get to “Medicare for all” than Sanders’s proposal. “While Republican leaders and President Trump continue their efforts to takeaway health care that millions of Americans depend on, Medicare for All legislation has helped re-ignite an urgently needed debate about reaching universal health care coverage,” she said in a statement.